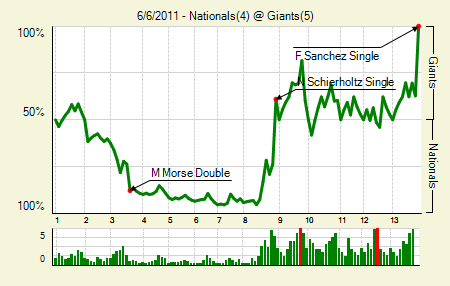 Moving the Needle: Freddy Sanchez ends it in the 13th with a walk-off hit, +.372 WPA. The Nats had a 4-0 lead through six, and they were up 4-1 through seven. But the bullpen blew it in the eighth. The Giants picked up three to tie, and then nearly walked off with the win in the ninth. Both teams had their chances in extras, but it wasn’t until the 13th that the Giants finally came through. A walk and hit set up Sanchez, who hit an easy double down the right field line. Of course, he gets credit for only a single, but I don’t think that much matters. Aaron Rowand: 1 for 6, 1 HR. His seventh-inning shot got the Giants rolling. Mike Morse: 2 for 5, 1 2B, 1 HR. In 465 PA in the last two seasons he has a .371 wOBA. 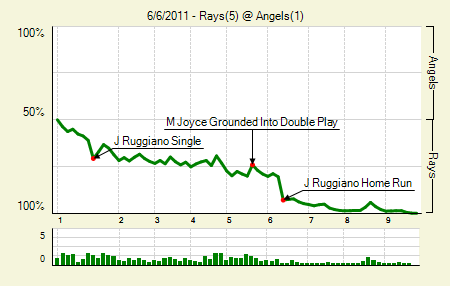 Moving the Needle: Justin Ruggiano hits a two-run homer to extend the Rays lead, +.125 WPA. He hit it with the swagger of a guy whose done it a hundred times or more. On the sixth pitch of his battle with Ruggiano, Tyler Chatwood laid one over the plate. Ruggiano turned on it and gave his bat a little “it’s gone” toss. That made it 4-0 Rays, which would hold up easily with their ace on the mound. For Ruggiano it was his third hit of the season in his seventh game played. David Price: 7 IP, 5 H, 1 R, 0 BB, 7 K. He continues to suppress walks, which is the only real difference between his numbers this year and his numbers last year. Yet, strangely, to this point his ERA has predicted his FIP and his FIP has predicted his ERA. Reid Brignac: 3 for 4. They were all singles, but Brignac will take them any way he can get them; he has a .190 wOBA (.186 AVG, .220 OBP) in 124 PA this season. 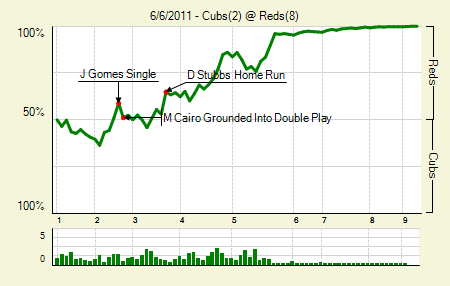 Moving the Needle: Drew Stubbs goes deep to give the Reds a lead, +.118 WPA. With the game tied 1-1 in the third Drew Stubbs took an outside fastball over the right field wall to give the Reds the lead for the first time. That was his ninth homer of the year and second in two games. That’s a nice recovery after a little drought; before Sunday he hadn’t hit one out since May 11th. The Reds then added a pair in the fourth before jumping out way ahead with three in the fifth. Mike Leake: 8 IP, 10 H, 2 R, 1 BB, 3 K. As the 10 hits might indicate, he had just one 1-2-3 inning all game. He has now thrown 20 innings and allowed six runs in his three starts back after his demotion. Jay Bruce: 3 for 4, 2 2B. He scored all three times on base, though he didn’t drive in any. Jonny Gomes: 2 for 3, 1 HR, 1 HBP. His three-run homer in the fifth put the Reds way ahead. Moving the Needle: Adam Rosales provides the biggest positive and negative swings, +.118 WPA and -.124 WPA. In his first game of the season Rosales found himself in the middle of the action. In the fourth he took Brian Matusz deep, cutting the Orioles lead to two. He was so excited to hit it, in fact, that he nearly caught Mark Ellis on the base paths. In the sixth he came up with runners on first and second with one out, but he hit one back to the pitcher for a double play. The A’s went nine up and nine down after that. Matt Wieters: 2 for 4. No Oriole had an extra base hit in the game. Wieters was the only one to both drive in and score a run. 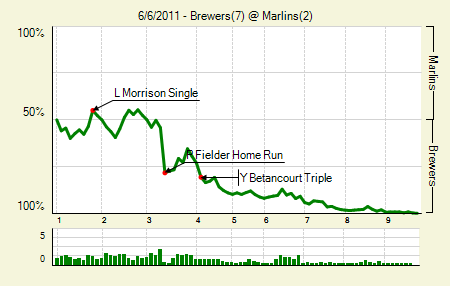 Moving the Needle: Prince Fielder’s three-run shot puts the Brewers up big, +.241 WPA. It was a pretty familiar sight. Rickie Weeks walked and, two batters later, Ryan Braun singled. That set up a chance for Fielder, who took the first pitch deep over the wall in right. The Brewers would then tack on another pair in the fourth, chasing Javier Vazquez from the game and ending his short streak of good starts. Logan Morrison: 3 for 4, 1 2B. He drove in both Marlins runs. Zack Greinke: 7 IP, 2 R, 1 BB, 6 K. That’s two straight without surrendering a homer for Greinke. Now we’re just waiting on his first scoreless start. Rickie Weeks: 1 for 3, 1 2B, 2 BB. He’s second among MLB second basemen in wOBA, though the man in first, Howie Kendrick, is playing more LF than 2B these days. 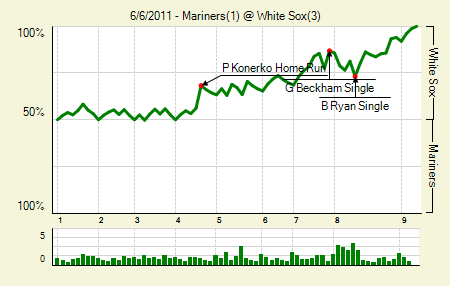 Moving the Needle: Paul Konerko turns on one and gives the White Sox a 1-0 lead, +.121 WPA. If you throw Konerko a hanging slider, he’s often going to put it out of the reach of your fielders. That happened in the fourth inning, with the game still scoreless. His homer represented the only runs in the first six and a half innings of the game. The Sox then came back and extended their lead in the seventh and eighth. John Danks: 7.1 IP, 7 H, 1 R, 1 BB, 6 K. How this loser figured out how to win a game, I don’t know. In any case, his xFIP is down to 4.03, which is right around the marks he’s produced in the last three years. Carlos Quentin: 2 for 4, 2 2B. He’s hit in eight straight, going 10 for 26 with four doubles and two homers. Michael Pineda: 7 IP, 5 H, 2 R, 2 BB, 3 K. It’s odd to see such a low strikeout game from him, but it worked out in any case. Again, the lack of offense was the killer for him. Moving the Needle: Ryan Howard’s single gives the Phillies a 2-0 lead, +.105 WPA. Both offenses took a step back in this one and let the lefties do their things. Ted Lilly lost the battle, though, when he slipped up a bit in the third. A leadoff double by the No. 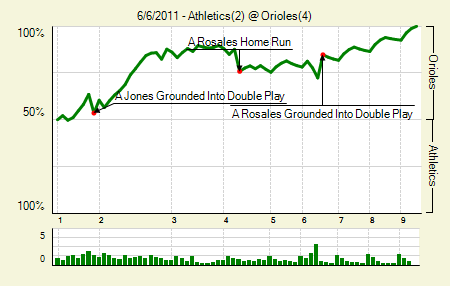 8 hitter set up an easy sacrifice, and then, after a walk, Placido Polanco came through with the game’s first run. Two batters later Howard drove in another, making it 2-0. 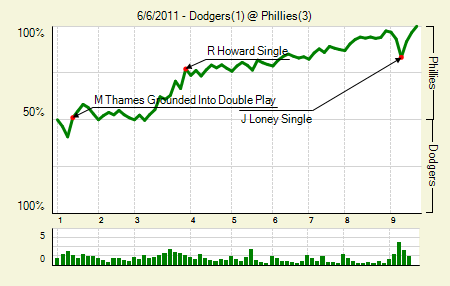 The Phillies would get one more before the Dodgers finally got on the board in the top of the ninth. Cliff Lee: 7 IP, 7 H, 0 R, 1 B, 10 K. All those strikeouts can be rough on the pitch count. Lee had thrown 117 after seven, which meant he couldn’t continue his brilliant performance. Carlos Ruiz: 2 for 4, 1 2B. he provided some insurance in the eighth with an RBI double. Moving the Needle: Matt Tolbert shoots one through the right side to score two, +.180 WPA. The theme of Tolbert’s hit: minimum effective dose. He came up in the second with runners on second and third with two outs and his team down by two. All he needed was a single, and that’s what he got. It was pretty well struck, though, and got to Shin-Shoo Choo in a hurry. The Twins had Delmon Young test his arm, a risky proposition to be sure, but Young slid in just ahead of the tag. 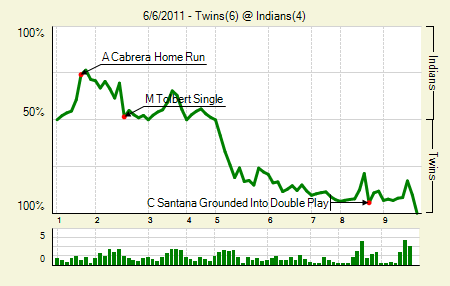 The Twins then grabbed the lead in the fifth and didn’t look back. That’s five straight for the Twins, which is pretty unbelievable given their current lineup construction. Delmon Young: 2 for 4, 1 2B. He needs it after an agonizingly slow start. The double was of the bloop variety, landing just past the sliding Grady Sizemore. Michael Brantley: 3 for 4, 1 2B, 1 HR. His numbers would look even better in CF, where he might be a better fit than the oft-injured Sizemore right now. 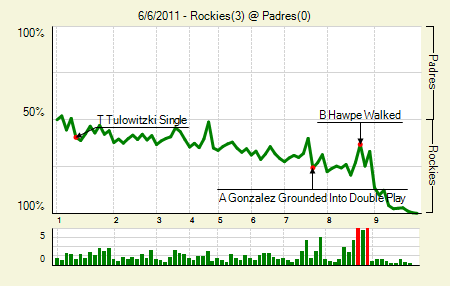 Moving the Needle: Alberto Gonzalez fans to end the Padres’ threat in the eighth, -.193 WPA. The biggest negative swing was bigger than the biggest positive swing by a pretty sizable margin in this one. The biggest positive, Troy Tulowitzki’s RBI single in the first, was the difference in this one in the eighth, when Gonzalez came to the plate with the bases loaded and two outs. The threat would end there, though, as Matt Reynolds sent him down swinging. The Rockies then put two on the board in the ninth, which made life easier for Huston Street. Clayton Richard: 7 IP, 5 H, 1 R, 3 BB, 8 K. Last season he struck out a career-high 10 against Colorado. Eight was just fine this time. Chris Nelson: 2 for 4, 1 2B, 1 3B. He’s had a quick little start to his 2011, 5 for 14 with two doubles and that triple. Clay Mortensen: 6 IP, 5 H, 0 R, 2 BB, 3 K. His ERA says 3.20, but I trust the 24:21 K/BB ratio signals a coming correction. 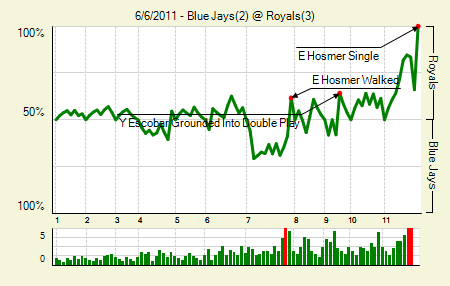 Moving the Needle: Eric Hosmer provides the walk-off hit, +.339 WPA. Hosmer really was the difference for the Royals last night. Twice he came up in bases loaded situations, and twice he came up big. The first came in the seventh, after the Blue Jays had taken a 2-1 lead in the top half. The Royals loaded up the bases with two two-out walks. Hosmer then drew a walk of his own — on four pitches, no less — to bring home the tying run. In the 11th he dunked the first pitch he saw into shallow center, easily bringing home the winning run from third. Mike Aviles: 1 for 4, 1 3B, 1 BB. Notable, because his triple didn’t even make it to the wall. Dude was thinking three from the second he left the box, apparently. Brandon Morriw: 6 IP, 2 H, 1 R, 3 BB, 5 K. That’s a Morrow-like start, minus a few Ks. Felipe Paulino: 6.2 IP, 3 H, 2 R, 3 BB, 4 K. It might not be the most sustainable performance, but the Royals have done well with him so far. That’s all you can ask from a guy who got released a few weeks ago. Moving the Needle: Brennan Boesch hits his first homer of the game, +.171 WPA. As the final score indicates, this was a slobberknocker in Texas. Boesch struck the big hits, absolutely destroying two pitches that went way over the fence. 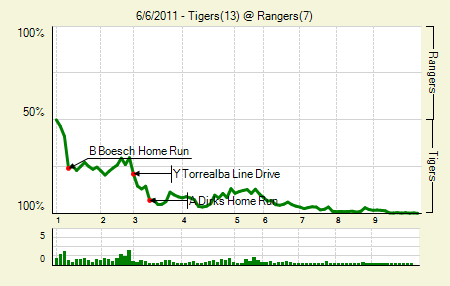 The first was the biggest, since it came in the first and plated three runs before the Rangers got an out. He then singled in his next at-bat, and then hit an RBI double in his fourth. On the day he was 5 for 6 with a double and two homers. Nelson Cruz: 2 for 4, 2 HR. The Texas natives went nuts for Cruz’s first homer, even though it was still a 9-4 Tigers lead. He now has seven homers in 14 games since returning from the DL. Andy Dirks and Alex Avila: both 1 for 5, 1 HR. I just wanted to say that Dirks kinds reminds me of Johnny Damon, both his swing and his mannerisms in the field. Austin Jackson: 3 for 5, 1 2B, 1 BB. He scored three runs while generally fulfilling his leadoff man obligations. We hoped you liked reading The Morning After: Game Recaps for June 6th by Joe Pawlikowski! If you are trying to imply that Danks’ winless record was due to bad luck and he has pitched well this year then you are half right. That was very true in April but check out his May numbers. He was instrumental in every one of those losses and wassn’t any good even when he managed to record an ND. I’m not implying that it was all luck. Clearly some bad luck was involved. But it was more that he was slumping, like all players do at some point or another. Hence the snark towards the overreaction to said slump. I think we are in agreement here. A run of bad luck followed by a slump ends up looking extremely bad. When it comes to start a season it looks even worse. If he would have gotten some offensive support in the first month and gone, say, 3 – 1 it would have been a lot different. Throw in meatball talk radio and I can see why Danks snapped at the press a week or two ago. I think we are in agreement here. A run of bad luck followed by a slump ends up looking extremely bad. When it comes to start a season it looks even worse. If he would have gotten some offensive support in the first month and gone, say, 3 – 1 it would have been a lot different. Throw in meatball talk radio and I can see why Danks snapped at the press a week or two ago. Unfortunately, he chose to open his mouth at a time when his arm wasn’t backing him up. He should have won 4 of his first 5 appearances, at least.